Sip a Dark & Stormy at the historic inn while weathering the weather. 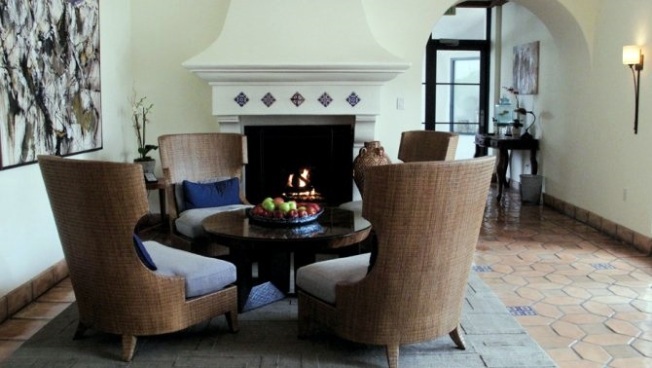 Retreat to the cozy environs of the historic inn while weathering the weather the El Niño winter. RAIN, RAIN, PLEASE COME AND STAY: Sometimes a time-honored nursery rhyme deserves something of a topical twist or modern interpretation. In that spirit, many Californians are imploring wet weather to make itself comfortable 'round the state this winter, the better to build up that snowpack and bust some drought. It's a spirit many destinations are embracing as well, and not just the ski resorts, places that love to see the flaky inches build up. Even some spots in sunnier areas are not chiming in with the ol' "rain, rain go away" rhyme, but rather are supporting any showers that come along with cozy-times packages for guests. THE OJAI VALLEY INN & SPA... is one such resort that isn't resorting to bemoaning any moisture but, rather, applauding it. For sure, you're bound to see a lot of sunshine in the inn's online snapshots -- Ojai is, of course, home to the daily Pink Moment, a sun-pretty, sky-lovely phenomenon -- but the resort knows how to play in the rain as well. There are two packages available through March 2016, one for lovebirds looking to dry their wings -- Romancing El Niño -- and one for families who don't mind playing in a puddle or two (that's the Me, You & El Niño, Too). Each comes with its own stay-inside perks -- a Dark & Stormy cocktail for two is included in the romance package, while the family deal has "an array of complimentary family-friendly in-room movies." And both include an Ojai Valley Inn & Spa umbrella, not just for use around the property should it rain, but for those back-at-home storms, too. FOR SURE, SUNSHINE AND VACATIONS... go together like sunblock and swimming pools, but the weather, as every traveler knows, often has different plans. Definitely in an El Niño year we should expect unpredictable skies, but with gratitude. Snowpack, keep building up while Ojai vacationers retreat to their pretty rooms to sip cocktails, watch films, and cozy in.